It was Pedro-palooza. It was foul pole-to-foul pole, wall-to-Wall adulation. Fenway Park was a sea of love for the man who gave the best years of his life to Red Sox Nation. And then the ghost of John Wasdin invaded the body of Pedro Martínez and a much-hyped showcase morphed into Sonny Liston vs. Floyd Patterson with Pedro hitting the canvas before anybody ordered a second beer. Pedro last night returned to the Fenway mound for the first time since October 2004 and in three innings he gave up eight runs (six earned) on seven hits, two walks, and one hit batsman. He rarely cracked 90 miles per hour and needed 75 pitches to get through the three frames. Even Grady Little would have pulled him out of this one. Darren Oliver was summoned to pitch the fourth inning as the Red Sox cruised to their 11th straight victory, 10-2, over the Mets. Putting aside the line score, Pedro went out of his way to thank the Boston fans after the beating. ``Regardless of the result of the game, I'll always remember this as one of the best moments of my life," he said. ``I did get caught up a little in the emotions. The way the people showed me they care was just great. . . . I will always appreciate them and keep them in my heart." This had none of the on-field drama of Roger Clemens's return to Fenway in the summer of 1997. There was certainly no walkoff moment featuring Pedro staring upstairs at Larry Lucchino. Pedro's entire night's work took less time than Carlton Fisk's Hall of Fame acceptance speech. ``I didn't have anything," he admitted. ``I couldn't spot the ball. The Red Sox are a hot team right now. They can unload on anybody. . . . You have to be able to make pitches and I wasn't able to and I paid." He first appeared on the Fenway lawn at 6:35 p.m. stepping out of the third-base dugout and walking across the infield toward the visitors' bullpen. Fenway fans cheered every step and several times Pedro raised his blue glove in salute. These people came to vote for Pedro. The only thing missing was the soundtrack from ``Gladiator." Bronx cheers? Boos? The Damon Treatment? No way. This was Ripken returning to Camden Yards, Streisand at Carnegie Hall, Ann Coulter standing at the podium at the Republican National Convention. Fenway was electric, New England televisions were locked on NESN, and the blogosphere slowed to a crawl as team-jersey-wearing fanboys (an army of No. 45s) fired missives at a record clip. At 7 sharp, he walked in from the bullpen as fans stood and applauded. If there were any boos, they were smothered by the adoring legions. When Pedro got to the dugout, Mr. Met greeted him with the ``We're not worthy" gesture. It is known that Mr. Met does not get along particularly well with Wally the Green Monster (it's one of those Pedro-Schilling jealousy things) and Mr. Met's willingness to fly to Boston for this game underscored the magnitude of the event. The Mets went quickly in the top of the first and Pedro had some bounce in his step when he came out to grab the resin bag for the first time. Players from both benches were perched on the top step of their respective dugouts while he threw his warmup tosses. Pedro's record was 7-3, his ERA 3.01. There was no indication that he was about to be pummeled. Suddenly, like a thunderclap in the middle of a sleepy summer night, Kevin Youkilis brought a competitive edge to the proceedings when he lined Pedro's second pitch into center for a single. After Mark Loretta poked a single to right, David Ortiz stepped to the plate. Back in the day, Pedro routinely made Big Papi look silly (3 for 15, six strikeouts). He'd strike him out a couple of times, then take him to dinner. This time, he got Ortiz to hit a hard grounder back to the mound. Pedro had an outside shot at a triple play, but after looking to third, then second, he threw to first to get one out. It was inexplicable. ``I got caught up in the emotions and I wasn't mentally prepared to do what I had to do," he said when asked about his misplay. Manny Ramírez was 4 for 29 with 13 strikeouts and no walks against Pedro. This time he walked. Trot Nixon brought a run home with a sacrifice fly to center, then Jason Varitek -- a guy who probably knows Martínez better than anyone -- cracked a single to center to score Loretta. Just when most of us had forgotten, the Lastings Milledge Factor reared its head. Mike Lowell lofted a routine fly to left. Milledge, clearly still spooked by the Green Monster, let this one clang off his glove for two more runs. A few fans were chanting, ``Who's your daddy?" when Coco Crisp grounded to second to end the rally on Pedro's 29th pitch. Finally safe in the dugout, Pedro gave Milledge a pat on the back. We saw some of old Pedro when he drilled Loretta in the wrist on an 0 and 2 pitch (``The only time I tried to get a fastball in," Martínez said) with two outs and nobody aboard in the second. At that moment, fans took hold of their senses and booed the Mets' pitcher. That's what you're supposed to do when the guy in the other uniform hits your .317-hitting second baseman while trying to back him off the plate. Ramírez led off the third with a double into the left-field corner, then scored on a single to center by Nixon. After a single by Varitek, Lowell grounded into a double play, scoring Nixon to make it 6-0. Clearly not himself, Pedro walked Crisp on a 3 and 2 pitch, then surrendered a homer into the Monster seats to Alex Gonzalez on a 1 and 0 pitch. 8-0. That's when we heard some chants of ``Paay-drooo." An agitated Pedro fanned Youkilis to end the inning. That was it. Pedro never came out for the fourth. Like a lot of superhyped events, this one failed to live up to expectations. 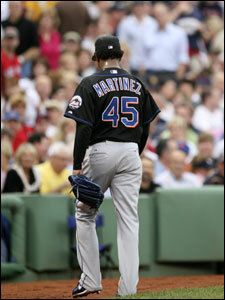 ``Obviously he didn't have his good stuff," said Mets manager Willie Randolph. ``He got caught up in the moment a little bit. Every once in a while you're going to have a stinker. I guess coming back here was a lot for him and he didn't have that focus." ``I'm not disappointed at all," said Pedro. ``The reception I got overmatched what I did out there. I'm extremely happy. I didn't have my `A' game. You just tip your hat and let it go." So once again, the tough ticket did not yield the expected thrill. Pedro was routed. Pedro was gone early. And Red Sox fans had to settle for the Sox' 11th straight win.